In size this manuscript is not untypical of Bibles that were produced in their hundreds in the 13th century; but it has several very unusual features. 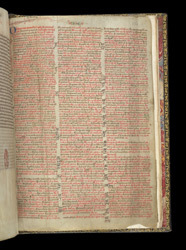 For example, the main text of almost all medieval Bibles was written with two columns per page, not one, as we find here. Secondly, this manuscript has a liturgical calendar and a long series of sermon notes between the Old and New Testaments. The calendar has previously been taken to indicate a Dover origin, but Christ Church, Canterbury (of which Dover priory was a cell), is more likely. It was certainly owned by Roger Bennett, a monk of Christ Church in the 15th century. The final leaves of the manuscript are filled with readings to be said on various important days throughout the church year. After readings for the Temporal, Sanctoral, and the Common of Saints are (in the lower right-hand corner of this age) readings for the ordination of deacons, priests, and bishops: these ordinations would be performed by an archbishop, further evidence that this manuscript was written for use at Canterbury, not Dover.